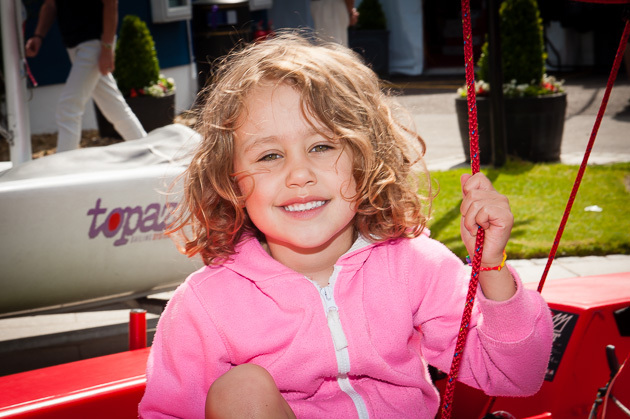 The Open Day by this stage had rapidly started to fill up with members of the public arriving in droves and ebullient mood and ready to enjoy themselves to the full with all the entertainment and exciting activities lined up for them. 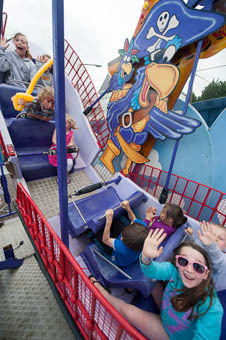 There were thrills and spills and delighted screams from the little ones as they enjoyed an assortment of rides and roller coasters and the face painting tent boasted a long queue for the day with all sorts of weird and wonderful faces arriving out to greet their parents. There was a variety of cosmopolitan and Irish food available in the several food outlets and complete with a magician to provide entertainment in the marquee what more was needed to make for a wonderful day except for the outstanding and colourful red dressed Bonga Band that entertained for the day and even led several packed congas with children, adults and even some canines taking part. Some sight for the unprepared visiting sailors arriving ashore to register for the week!! A gleaming open topped double decker red bus made regular departures from the Club to Camden throughout the day, again another wonderful experience with the unfolding panorama of Cork Harbour appearing as the bus progressed up the very narrow winding road, in itself another wonderful experience with oohs and aahs of excitement as the passengers almost brushed the over head branches. They were well rewarded when they arrived at the spectacular experience that is Camden Fort Meagher and here they were also able to partake of delightful goodies as they wished in the excellent and very popular café/teashop whilst at the same time admiring the unrivalled scene from the viewing balcony before their return to the club. 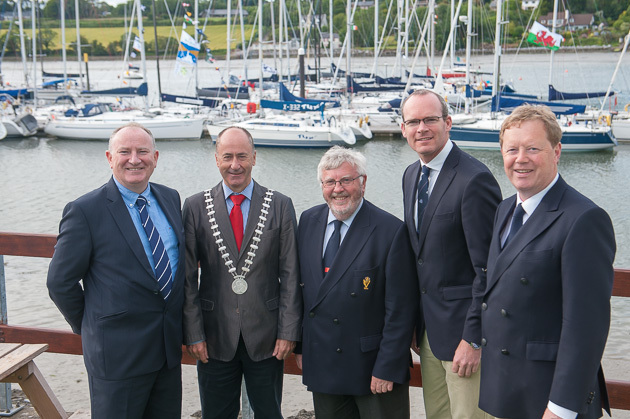 When all the visitors and families at the Open Day had left the club it was then time to make way for the Official Opening of Volvo Cork Week 2014 which was performed by Minister for Agriculture, Food and The Marine, Simon Coveney, TD. Vice Admiral and Chairman of VCW, John Roche was acting as Master of Ceremonies and called first on Admiral Pat Lyons to commence the proceedings. 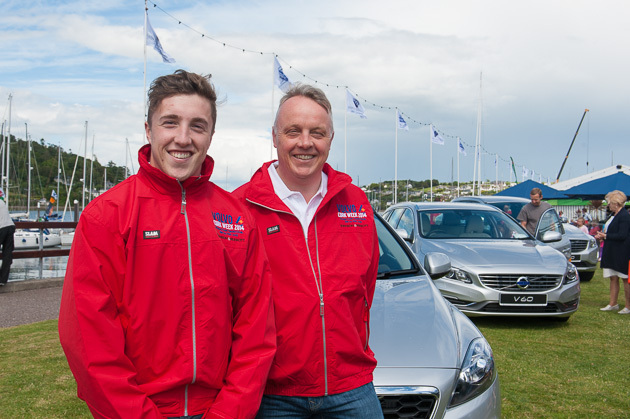 The Admiral thanked the sponsors, Volvo cars Ireland in association with Johnson and Perrot Motor Group, Cork County Council, Heineken and Port of Cork. 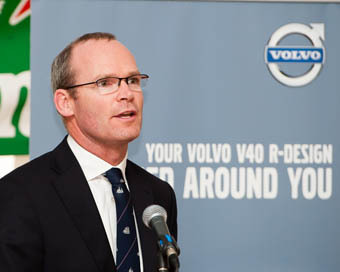 This was followed by a brief speech from Adrian Yeates, Managing Director Volvo Car Ireland Ltd. Finally it was time for the Minister to declare the event open. 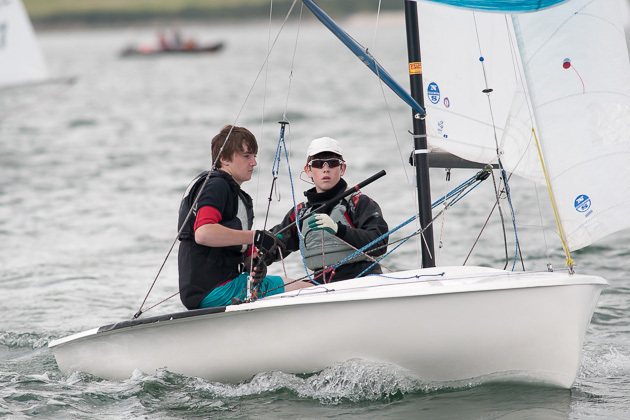 He was on his own territory in his home club, the Royal Cork Yacht Club, and as ever received an extremely warm reception and acknowledgement of his excellent speech interspersed with some hilarious moments to the delight of the assembled gathering. This concluded the opening ceremony.